As the title of this biography implies, singer Mark Murphy (1932-2015) was the quintessential jazz aficionado’s favourite, possessed of a rich, agile baritone and a technique to die for, yet throughout his life known only to diehard fans of the music. An outsider – gay at a time when homosexual activity was illegal, determinedly non-commercial in a milieu in which similarly gifted individuals (the likes of Mel Tormé, Tony Bennett and Johnny Mathis) became household names, an improvising artist rather than a crowd (and record-company) pleaser – he lived a determinedly bohemian life, somewhat in the manner of his great literary hero, Jack Kerouac, vividly portrayed in this dramatic yet meticulously researched account. 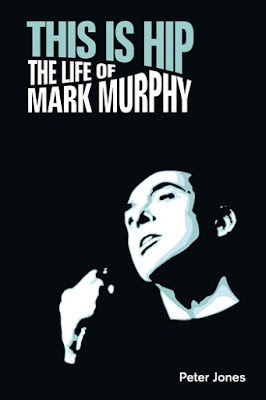 Peter Jones, himself a jazz singer, sums his subject up thus: "… all attempts to cast Mark Murphy from some pre-existing mold were doomed to failure. He was an educated middle-classs man who never showed the slightest interest in money or the pursuit of a conventional career. He was a white man whose entire being was consumed with his love for jazz, which despite its hybrid origins has long been considered a 'black' art form." Jones documents Murphy’s life, from its beginnings in the far north of New York state, through his childhood in a small mill town, Fulton, and his subsequent career travelling the world singing and teaching, with exemplary care and sensitivity, deftly weaving fellow musicians’ and fans’ accounts into his own fascinating narrative. Skilfully interspersing the personal (Murphy’s initial catching of the jazz bug – like Charlie Parker did – from early exposure to Art Tatum; his idolisation of Peggy Lee and its somewhat disillusioning consequences; his chequered recording career and the often shabby treatment he received from the industry; his relationship with partner Eddie O’Sullivan; his poignant death in a nursing home) with contemporary social history (changing attitudes to homosexuality, the civil-rights movement, the effect on song lyrics of shifts in sexual politics, etc. ), This is Hip is thus not only a thoroughgoing, definitive, intensely readable portrait of one of jazz’s most unjustly neglected figures, but also a perceptive and valuable study of the artistic sensibility negotiating the unpredictable tides of societal change. In short, this is a model biography. Richly detailed, balanced and consistently thoughtful, it should be enjoyed not only by its core audience, committed Murphy admirers, but also by the general reader.